Five lively diamonds sparkle in this antique wedding ring. At the mid-point of this classic 5 diamond wedding is a one-half carat bright white old European-cut diamond (0.49,I1,G). Closest to the center point, are two additional old European diamonds to adorn this ring. Descending in size, while adding fire to this ring shoulders, are two smaller round diamonds. The white gold topped mounting enhances the beauty of these diamonds. An open under surface adds a special touch to this ring. This antique wedding ring is made with a 14kt (585) white gold top and a 14kt (585) yellow gold underside. Old European-cut diamonds refer to the type of diamond cut, not the country where the diamonds originated or were cut. This ring was made in the USA. Old European-cut diamonds were cut in the early 1900s. They are adored for their high diamond crown and fewer diamond facets. Find their romantic fire under candlelight. 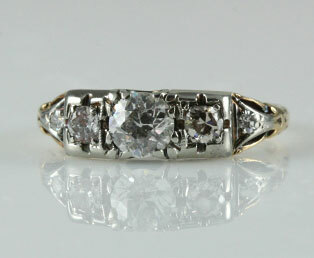 This antique 5 diamond wedding ring is in very good condition.